SEE YOU IN THE WOODLANDS! General Admission (GA), VIP, and Super VIP (SVIP) Passes are available! Lock in your Camping, Lodging, Hotel Package, or other accommodations now for Firefly 2019! Join The Great Atlantic Campout, the immersive camping experience at Firefly Music Festival. Bring your own camping supplies, choose from one of our Glamping or pre-set tent options, bring an RV, or book a hotel and shuttle package - it's all available in The Woodlands! Customize your experience with Firefly Add-Ons! Options like GA+ Access, Front Row Viewing, or a Spruce Up Pass will enhance your festival fun! 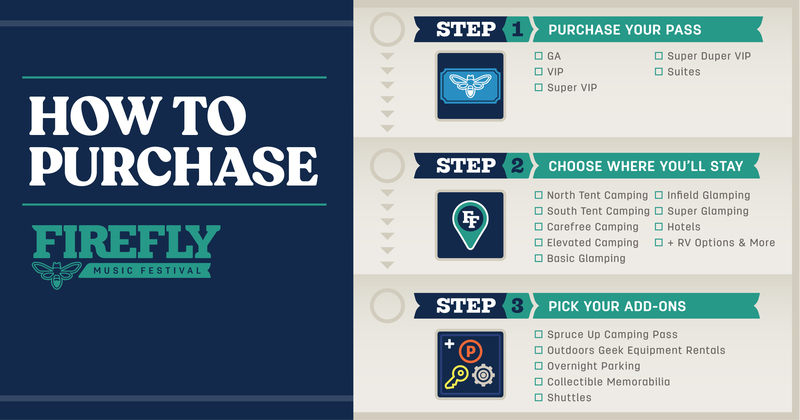 Secure limited edition collectable Firefly gear, line up a shuttle to transport you to the festival, or rent a tent if you're traveling without equipment. Taking one of Firefly’s official shuttles is the best way to begin your festival experience. We’ve partnered with Bus.com to create special shuttles from New York, Philadelphia, Wilmington, Baltimore, and DC.